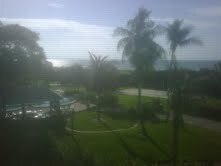 Ben Bernanke is in Jackson Hole this weekend on vacation so I decided to go down to Sanibel Island for a long weekend. The weather is incredible and I'm catching up on some great reading that I haven't had time for back home. I'll be here through Tuesday, and I will try to update the site as much as possible before I get back. He is also the co-creator of the Case-Shiller home price index, so his words on the housing market should be listened to closely. The world council reported this morning that gold demand surged 36% in the second quarter. Investment demand is now back to levels seen during the height of the financial crisis, and we haven't even entered the next crisis yet. You can determine when an investment is overvalued because as prices rise, an enormous surge of supply comes onto the market. This was seen during the telecommunication boom in 2001 as companies were purchasing enough underground wiring to supply four times the world's population. It was also seen during our housing boom as inventory supplies surged with the prices rising. Today we see it in the US government debt bubble as record new supply year after year is now being met with record high prices paid for these bonds. It takes years to develop a new gold mine, unlike building a home or putting wires underground. This comes at a time when the Fed is ready to unleash the next flood of printed currency into the market. 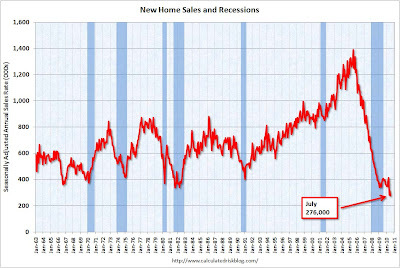 Coming in line with the existing homes sales number yesterday, the new homes sales number we received this morning for July was tragic. 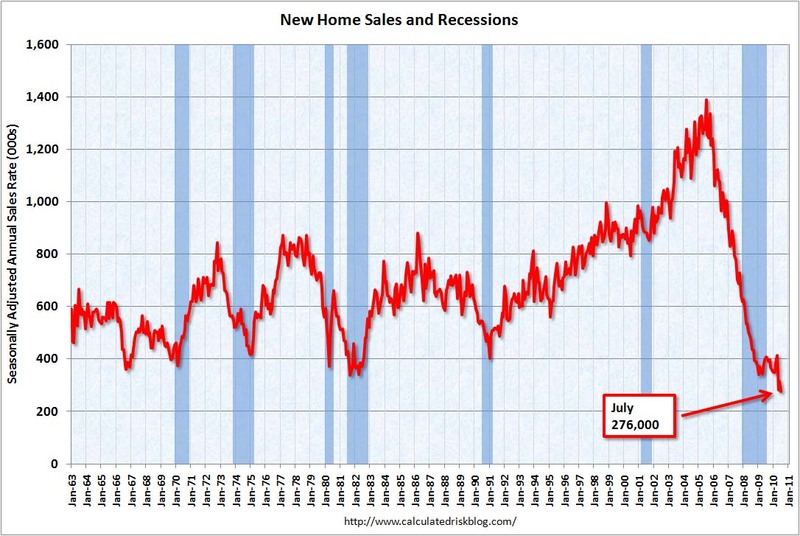 25,000 new homes were sold in July bringing the annual rate to 276,000, down 12 percent from the previous month. The June number was also revised down to 315,000. 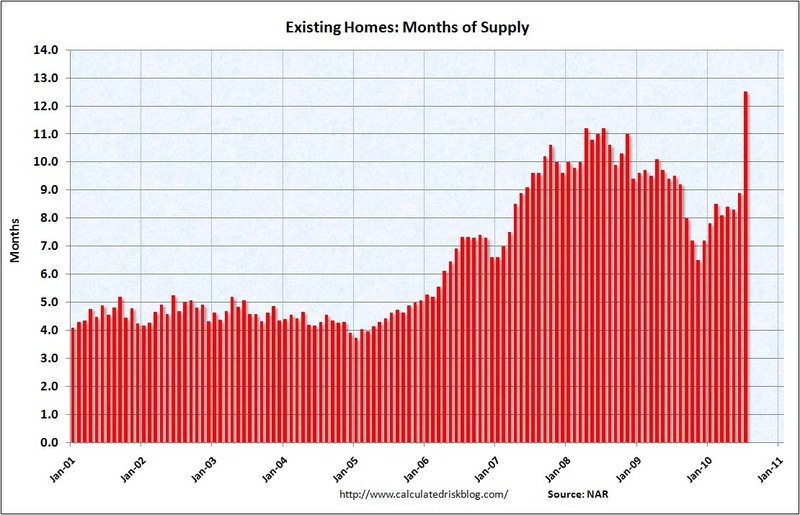 Housing bears have had this date, August 24th, circled on their calendars for many months. 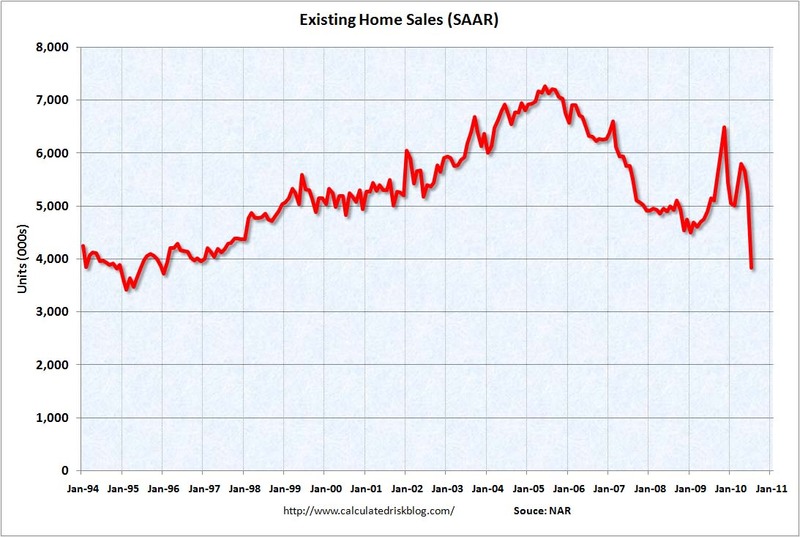 Today we received the existing home sales for the month of July. July was the first full month with no artificial juicing from the home buyer tax credit. 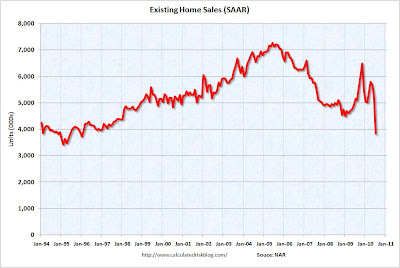 In other words, it is a real look at the housing market. The numbers were beyond catastrophic. This does not include the "shadow" supply of foreclosed homes that banks are (currently) holding off the market. The Case Shiller home price index works on a two month lag so we should see the plunge in home prices by September/October. The sales number this morning has rocked the stock market and has also inspired further calls for additional quantitative easing (money printing) from the Federal Reserve. Gold and Silver went vertical upward on the rumors. As the Fed does its best to destroy the country, and the recovery never comes, it now appears we will become a country of those that hold precious metals, and those that do not. 1. When will the treasury bond bubble explode? 2. How massive will the damage be? Remember, when the stock market bubble burst in 2000 the government printed money and ran massive deficits to try and artificially stimulate the economy. However, they also blew up a real estate bubble with their actions that burst in 2006. The government then printed even larger amounts of money and ran even larger deficits to try and artificially stimulate the economy. Only they used far more debt and got far less stimulus after the real estate bubble burst. Now we have reached the final bubble which is in US government debt. This bubble has formed due to their reckless actions after the previous two bubbles popped. Instead of taking our medicine then, we have now reached the worst possible scenario. The important thing to remember is that after the government debt bubble bursts, the government will not be able to step in and artificially stimulate. It will be game over. As Mr. Schiff says below, "this bubble will be larger than the stock market and real estate bubble COMBINED." Great article written today on not only why hyperinflation will happen, but how it will happen. Most authors believe it will be foreign selling that will trigger the event, however, this author shows how foreign selling does not even need to occur and the final outcome will be the same. Click Here: "How Hyper Inflation Will Happen."